My good friend E's first time at the International Rose Test Garden. She was a professional flower-sniffer in no time. Some Sundays are just meant to be spent among the roses and Portland didn't earn her nickname, the Rose City, for no good reason. Besides the expected rain, hipsters, and coffee shops as far as the eye can see-- rose bushes planted in unexpected places are kind of Portland's thing. Start looking and you may be surprised at the next place you find one. Founded in 1917, the International Rose Test Garden contains more or less 10,000 plantings of 500 different varieties. There are four varying rose gardens to wander: the Gold Medal Garden, Miniature Rose Garden, Shakespeare Garden, and the International Rose Test Garden. 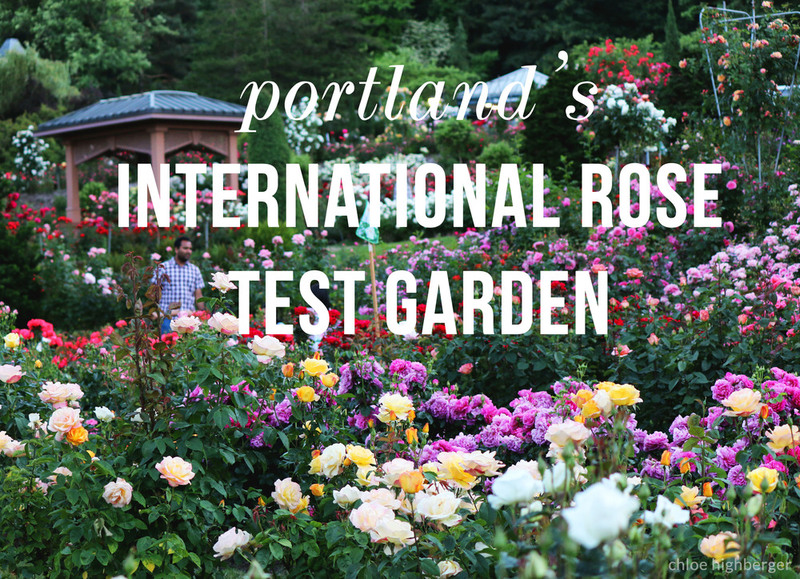 "The oldest public garden of its kind in the United States," the International Rose Test Garden remains one of Portland's best free activities. Typically blooming in early summer, the roses are the center of the city's affection for Portland's Rose Festival which takes place each June. Although peak crowds during weekend afternoons can sometimes make the bright rows of colorful flowers seem overwhelming, the garden transforms into the perfect secret hideaway on summer weekday evenings. Grab a blanket for a quiet post-work picnic on the lower lawn to unwind in the beauty of the gardens. Surrounded by rows of roses in bloom and a view of Mount Hood from the garden's perch atop the West Hills in Washington Park, the International Rose Garden is a place that makes Portland the charming sort of city where everything keeps coming up roses.